Twickenham may have had a workhouse in operation by 1726. The parish of St Mary, Ealing, erected a new workhouse in 1727-28 west of St Mary's Lane (now Road). A parliamentary report of 1777 recorded parish workhouses in operation at Acton (for up to 16 inmates), New Brentford (5), Chiswick (90), Ealing (100, Heston (30), Isleworth (110), and Twickenham (90). New Brentford established a workhouse in 1757 and, in order to try and reduce the rising poor rates, ended the giving of out-relief. The workhouse regime appears not to have been too severe, with adequate beds and reasonable meals — in 1759-60, the inmates had three meat dinners a week and up to three and a half pounds of meat per head. Gin, however, was banned from the premises. The workhouse inventory included four spinning-wheels with which the inmates produced a fairly coarse woollen yarn. After an initial decrease, the New Brentford poor rates returned to a high level and remained there. In 1784, concerns about the running costs led to an inquiry by the Vestry in which it emerged that workhouse suppliers no longer had contracts and were overcharging for their goods, a matter with the workhouse master had connived. It was also claimed that the overseers had been too lax in their duties, and that there were too many people being supported by the parish in the workhouse which at this time contained 7 men, 19 women, and 26 children. The workhouse had a number of problems in subsequent years. In 1787, a riot by inmates led divisional magistrates to propose that a 'room of confinement' be set up for trouble-makers. In 1791, the master, Joseph Smith, was dismissed for having an improper relationship with a young woman inmate who then revealed she thought she was pregnant. Four years later, the master and matron were discharged for not keeping order in the workhouse. In 1796, in an attempt to reduce costs and restore discipline, the running of the workhouse was contracted out. Work done by inmates in the early 1800s included some spinning, and the making of straw hats which was probably done by the children. The workhouse also possessed cobbling equipment. A pig-sty and chicken run were set up in the garden. In 1816, the regime appears to have been rather harsher than in earlier years, with inmates receiving only 16 ounces of meat per week and their work including the cleaning up of sewage. The Poor are partly relieved at home and partly in the Workhouse, the inmates of which are infirm and aged parishioners, and poor persons who meet with accidents in passing through the parish. It is a small inconvenient building, very ill adapted to the purpose. When full, 4 men sleep in a bed. At present (June, 1796) 3 men sleep in a bed, 4 boys in a bed, and 3 women in a bed. The beds are of feathers. Table of diet: Breakfast—Sunday, bread and cheese; Monday, Wednesday, Friday, broth from the beef of the day before; other days, milk pottage. Dinner—Sunday, Tuesday, Thursday, half a pound of beef, 5th part of a quartern loaf, and a pint of small beer to each person; Monday, Friday, milk pottage, 4th part of a quartern loaf, and a pint of small beer; Wednesday, suet pudding, 4th part of a quartern loaf, and a pint of small beer; Saturday, pease soup, 4th part of a quartern loaf, and a pint of small beer. Supper—every day, bread and cheese and a pint of small beer. Men who work out of the house are allowed each a pint of small beer at breakfast, children half a pint at each meal. Each person receives 20z. cheese at breakfast and supper. On Easter Day mutton is served instead of beef, and for two days at Christmas strong beer and tobacco is given. The sick only are allowed tea and sugar. The men are chiefly employed on the common, while at such work they are allowed 6d. a week for tobacco. The boys beat hemp, weave bed sacking and sacks, and make ropes. They are put to work at 5 or 6 years; a boy of 10 and 11 learns to weave tolerably well in a month, and weaves a sack worth 2s. 6d in two days. Many run away; the parish provides for others by sending them to a manufactory, when they are sufficiently skilful. Out of work hours they are taught to read by a schoolmaster, with the moderate salary of 2s. a month. The women and girls are employed in spinning hemp and dressing fine flax for sheeting The children are clothed by the parish. The boys receive a hat and coat every two years, a waistcoat and breeches every year, and other articles as they need them. In one year the parish cleared £90 after paying the expenses of raw material, etc. But between May and December, 1794, the receipts were £219, expenses £243, loss to the parish £24; and between 18th March, 1794, and 29th Feb., 1796, £40. It is evident therefore that the parochial manufacture is a losing concern. Middlesex: Acton (2), New Brentford (2), Chiswick (3), Ealing (5), Greenford, Hanwell, Heston (2), Isleworth (4), Perivale, Twickenham (3). Later additions: West Twyford (from late 1836). The population falling in the Union in 1831 had been 32,605 — ranging from Perivale (32) to Ealing (7,783). The average poor-rate expenditure for 1833-5 had been £13,779 or 8s.5d. per head of the population. A new Brentford Union workhouse was built at Isleworth on the east side of Twickenham Road in 1837-8. It was designed by Lewis Vulliamy who was also the architect of workhouses for the Epping and Sturminster Unions. His design for Brentford was based on the model cruciform layout published by the Poor Law Commissioners. Its location and layout are shown on the 1865 map below. Brentford workhouse from the south-west, 1839. In 1883, a workhouse school, known as Percy House, was erected fronting onto the Twickenham Road on land to the south-west of the workhouse. The buildings comprised a two-storey administrative block at the centre which also contained a chapel, dining-hall, kitchens and stores, with a laundry and swimming bath to its rear. The children were accommodated in parallel three-storey wings to each side, with boys at the north and girls to the south. From around 1900, the union increasingly placed pauper children in small cottage homes or boarded out with foster parents. By the outbreak of the First World War in 1914, the school was almost empty and in October of the following year the buildings were adapted for use as an auxiliary military hospital run by the Red Cross. During its period of operation, 4,989 wounded soldiers were treated at the hospital. 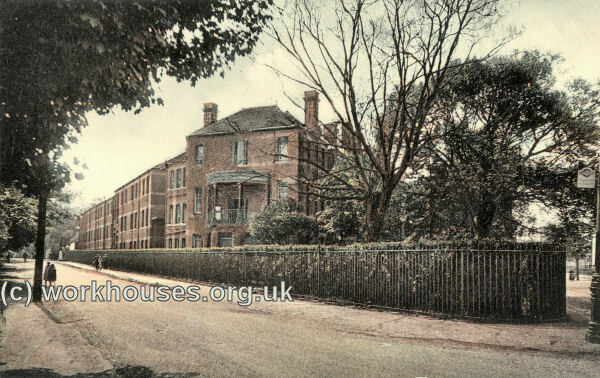 Percy House Military Hospital c.1916. 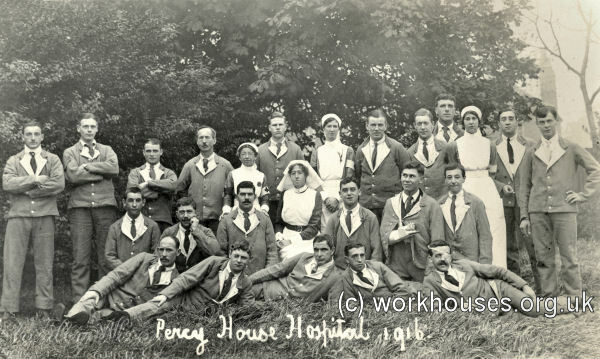 Percy House Hospital military patients with nurses, c.1916. After the war, the buildings were used to store military records until 1922. The buildings then stood unused until 1935 when they were converted for use as a home for the elderly. The home closed in the 1970s and most of the buildings were demolished in 1978. 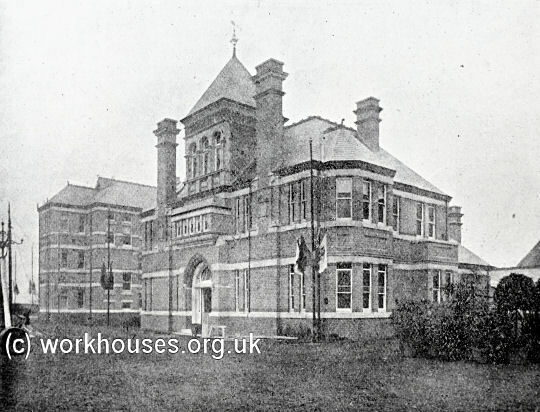 In 1895-1902, the old workhouse was demolished and replaced by a new infirmary. 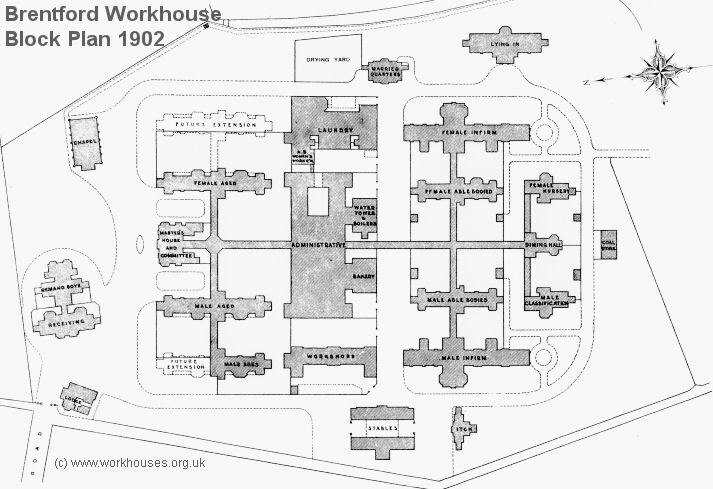 A much larger workhouse was then erected to its south-east, on land adjoining the Percy House School. The new buildings were based on a pavilion block layout designed by WH Ward of Birmingham. 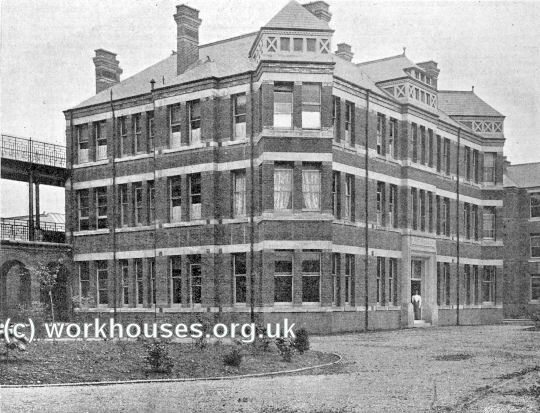 Brentford workhouse new infirmary site, 1913. Brentford workhouse new infirmary administration block from the north, 1896. The official laying of new workhouse's foundation stone took place on 1st March 1900. The ceremony, which took place in alrge marquee, was led by Alderman Hardy (Chairman of the Guardians) accompanied by the Bishop of Marlborough who conducted a religious service. The proceedings concluded with a luncheon party which included speeches and toasts to "the Queen", "the Clergy and Ministers of All Denominations", "the Success of the new Workhouse", "the Local Government Board", "the Middlesex County Council", "The Architects and Builders", and "The Officers". 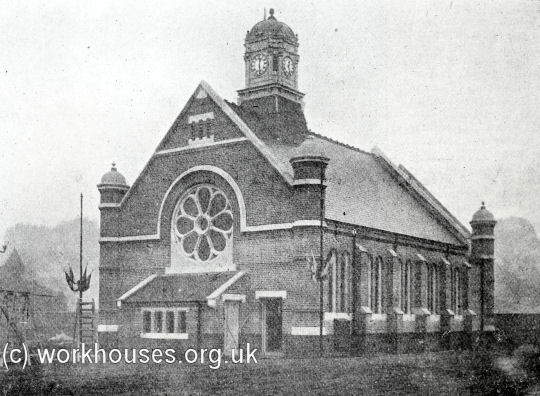 The opening of the new workhouse was celebrated in November 1902 and was the subject of a report in Building News. Tuesday, Nov. 4, the new workhouse at Isleworth for the Brentford Union was opened by Princess Christian. The following is a general description of the buildings. The site is situated on the land adjoining the union offices and district schools. Union-lane separates the two sites. At the corner of the site are the entrance gates and porter's lodge. In proximity to the entrance is the receiving block, provided with dormitory and dayroom accommodation for males and females. A disinfecting room is also provided, and store for paupers' own clothes. Adjoining are quarters for the girls and boys, with dormitory, dayroom, and officers' rooms for overlooking and supervision. The "official block" comprises porter's lodge, telephone-room, committee-room for the Guardians, master's office, clerks office, &c. and master's house. There is a private entrance for the master's own use. The main central corridor, 8ft. wide, is 525ft. in length, to which by cross-corridors are connected the blocks for the accommodation of the various classes of inmates. Following the main corridor at a distance of 80ft. from the main entrance, there is an octagonal waiting-hall for visitors. From this point runs the first cross corridor right and left, which forms the connection with the male aged block on the right and the female aged block on the left. The aged paupers' blocks are divided up into accommodation for the special classification of inmates which is so strongly advocated by the Local Government Board at the present time. These blocks are provided with airy dormitories, dayrooms. attendants' rooms, living-rooms, bath, lavatory, and w.c. accommodation, the ground-floor dayrooms having covered verandahs attached, while the dayrooms on the first floor also have airing space over the ground-floor bays. Fireproof escape staircases are provided to each block. Following the main corridor at a distance of 420ft. from the central entrance is the second-class corridor, running also right and left, and forming connections with the male able-bodied block on the right and the female able-bodied on the left. These blocks, as in the case of the "aged," are also divided up for special classification of the various classes of inmates, the females being provided with a separate dormitory for mothers with children and a day nursery in connection therewith. The accommodation provided generally consists in dayrooms, dormitories, attendants' rooms. Linen, box, wash, lavatory, and w.c. accommodation, fuel, store, &c. and fireproof escape staircases. Following the main central corridor for another 100ft. from the able-bodied blocks are placed the imbecile wards, connected also by cross "open" corridors, the male wards on the right and the female on the left, with a central building which comprises dining-hall, sewing-room, workshops, &c. The imbecile blocks are provided with wards, dayrooms, duty-room, bathroom, lavatory, and w.c.'s; also linen-room, fuel store. &c. and fireproof escape staircases. In connection with the various blocks named, spacious courts or yards are provided, and these are fitted with outside sanitary accommodation. These airing courts are paved with asphalte, thereby giving a quickly-drying and healthy exercise ground. The administration buildings, laundry, and workshops are placed in the centre of the institution. It consists of large general storerooms, matron's store, matron's office, cutting-out room, sewing-room, dry goods' store, and stores for meat, bacon, butter, milk, &c. and dairy. On the right of the main corridor in this block is the dining-hall, 60ft, by 35ft with separate entrances for males and females. Adjoining is the general kitchen 40ft. by 30ft. with a serving counter opening into the dining-hall, and leading out of the kitchen are rooms for cutting up, washing up, vegetable-room, and sculleries. Sleeping accommodation is provided over part of the administration-block for the male and female officers, properly classified, and with all necessary sanitary and other accommodation. In close proximity are the boiler-houses and bakery. The boiler-house, provided with two large boilers, has a large chimney stack 120ft. high. The bakehouse has convenient bread stores, flour store, bakers' room, &c. The laundry building fixed in the central position, to the left of the administration-block, is provided with separate receiving-rooms for officers, general inmates, and foul linen. &c. The washhouse is 70ft. long and 24ft. wide. An engine is provided for working the various machines. Space is provided for drying-horses. Continuing from the washhouse is the finishing and ironing-room (size 70ft. long by 24ft. wide), and the finishing-room and the delivery-room whence the linen is taken to the various blocks. On the right of the administration-block are the workshops, which comprise wood store, wood-sawing shop, tailors', shoemakers', carpenters' and paint shops. The stable block consists of stalls for ten horses, two loose-boxes, harness-room, coach-houses, &c. and yard. A building is erected for a limited number of married couples, with separated bedrooms, dayrooms, and lavatory and sanitary accommodation, giving deserving old couples the benefits of a separate home. A small block is arranged for "short-period lunatics." It provides for two patients (one male and one female), with padded-rooms, lavatories, w.c.'s, and attendants' rooms. The chapel is situated in the front of the site, next the cemetery. It is substantially- fitted up, and has an ornamental clock turret. A main roadway 20ft. in width runs round the whole of the buildings. The house is designed for about 800 persons, about 500 being accommodated at the present new buildings, and to get the full accommodation only two blocks in the male and female when only required will provide the full number at a small cost, then still leaving plenty of room for further extension. The buildings are of plain design, no money being wasted in ornament. The general work is executed in London grey stock-bricks, relieved with stone bands and dressings, and red brick strings, &c., and the roofs covered with slates. The staircases are all executed in hard York stone. The cost, when the workhouse is completed, will be £125 per bed. The work has been carried out by Messrs. J. Dorey and Co. of Brentford. The architect is Mr W.H. Ward. of Birmingham. The quantity-surveyor is Mr. F. T. W. Miller, of Westminster. Brentford new workhouse site, 1913. 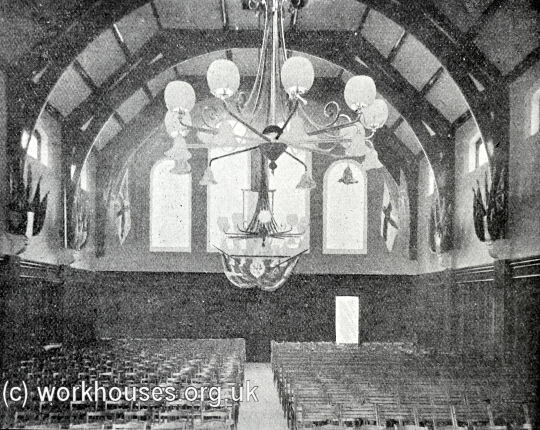 In its day, the workhouse was considered the epitome of workhouse design. It provided spacious modern accommodation which included separate accommodation for a whole range of inmates including the able bodied, the aged and infirm, expectant mothers and those with young children, married couples, the mentally sub-normal and the mentally ill, as shown in the block plan below. An old house known as Warkworth House, located to the south-east of the workhouse, was purchased by the union in around 1899. The building appears to have been employed as an annexe to the workhouse for various purposes. In 1916, it was certified for the accommodation of 38 male children who were classed in the terminology of the time as 'idiots' or 'imbeciles'. 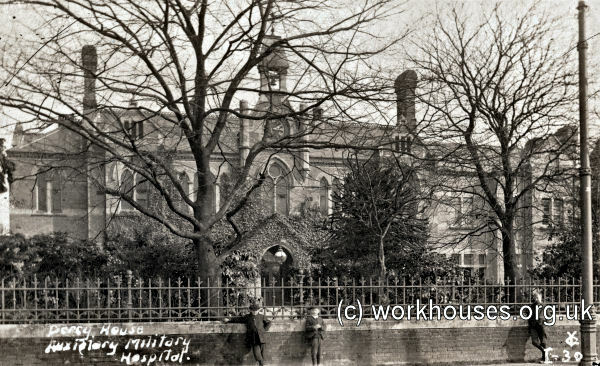 From around 1920, the workhouse was known as Warkworth House and the infirmary part of the site as the West Middlesex Hospital. In 1935, the two sections were merged to create the West Middlesex County Hospital, with most of the pauper inmates then being transferred to Percy House. In 1948, the site again became West Middlesex Hospital. Virtually all the old buildings have now been demolished. Brentford male infirm pavilion from the north-west, 2001. Brentford male infirm pavilion from the south-west, 2001. 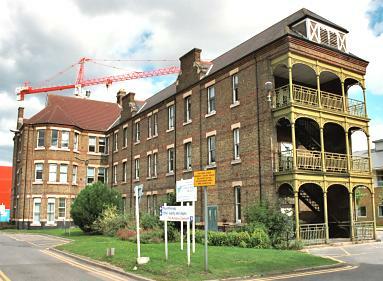 By 2001, the site was occupied by Hounslow and Spelthorne Mental Health Services. In 1914, the Brentford Union had a children's scattered home at 'Thistleboon' on College Road, Isleworth. By 1924, there were scattered homes at: 1-4 Montague Avenue, Hanwell; 24-26 Greenford Avenue, Hanwell; 23 Sunnyside Road, Ealing; 40-42 Llammas Park Road, Ealing; 21-23 Campbell Road, Twickenham; and 41-47 Beaconsfield Road, St Margarets. Dundee House, a building on Mill Plat, at the south of the workhouse, was employed as a Receiving Home for dealing with new arrivals into the system. London Metropolitan Archives, 40 Northampton Road, London EC1R OHB. Limited holdings include: Guardians' minutes (1836-1930); Staff records (1888-1931); Registers of apprentices (1848-1930); Registers of lunatics (1838-39, 1889-1936); Settlement examinations of lunatics (1900-03); Removal orders (1918-25); Registers of emigrants (1891-1927); etc. Cassell, W.A. (1972) The Parish and Poor in New Brentford, 1720-1834. Transactions of the London and Middlesex Archaeological Society, 23, No. 2, 174-93.